One class enjoyed an interesting project, in which each pupil picked one famous French-speaking person, e.g. from the list in the Teacher's Manual or on the CD-ROM. On the activity sheet "my famous person is...." [see right], they made a simple biography by finding the answers to 5 questions, such as "why should we remember them today?" They used this page and its links, and their CD-ROM encyclopedia. Each pupil presented their biography to the class, using Powerpoint. The class voted on who they thought were the Top 5 famous French people who had the most impact on the world. His name in French is Guillaume le Conquérant, and he was Duke of Normandy, a large area of northern France. In 1066 he took his army across the Channel, and killed the English King, Harold, and most of the English nobles in the Battle of Hastings. He conquered England and put his Norman followers in charge. His knights built strong castles like Dover, and his bishops built fine cathedrals like Canterbury. For the next 300 years, the King of England and all the important people in the country spoke only French. Today, English still has thousands of words which come from French. Monet was the leading member of the Impressionist painters. His most famous painting is the "Water-lillies" which he painted in the elaborate garden he had made for himself. Monet's famous painting of Waterlillies on BBCi's "Artyfacts"
Find some examples of Monet's paintings on the Internet. Try to paint your own pictures in a similar style. Claude-Achille Debussy (1862-1918) was a French composer whose work is often linked with the Impressionist painters. He is famous for piano pieces such as "Children's Corner" and his orchestral work "The Afternoon of a Faun" ("L'apès-midi d'une faune") . Camille (Charles) Saint-Saëns (1835-1921) was a French composer who is well known for "The Carnival of the Animals" a composition for orchestra, piano, xylophone and harmonica. "The Carnival of the Animals" and music by Debussy could be used to stimulate pupils' own musical compositions, as well as providing starting points for a whole range of dance-drama activities. Alexandre Dumas (1799-1850) wrote the two well known adventure classics "The Three Musketeers" and "The Count of Monte Cristo". Victor Hugo (1802-1885) Most pupils will be familiar with the Disney film and video "The Hunchback of Notre Dame". The original novel was written by Victor Hugo and is known in France as "Notre Dame de Paris". Antoine de Saint-Exupéry (1900-1944) the author of "Le Petit Prince" a well known French children's book. "Well, I must endure the presence of two or three caterpillars if I wish to become acquainted with the butterflies. It seems that they are very beautiful. " Children's adaptations of all these books are available from libraries and good bookshops. There is, of course, a very long list of key people who have featured in French history and the history of scientific achievement. Jeanne d'Arc [Joan of Arc] (1412-1431 approx.) was a village girl, the daughter of a farmer. She believed that the voices of St. Catherine, St. Margaret and St. Michael had ordered her to lead the French army into battle against the English who then ruled much of France, including the capital, Paris. She was told to see the heir to the throne crowned King Charles VII of France, and to help him drive out the English. The French had almost given up, but Joan persuaded Charles and the generals of the French army to let her take on this task and raised the siege of the town of Orleans. Charles was crowned King, but Joan was captured during a later attempt to reclaim the city of Paris. At this time the Catholic Church was dominant in both France and England. 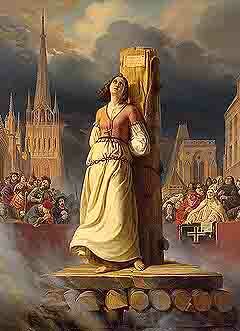 Joan was accused of heresy and was burnt at the stake outside Rheims cathedral (see painting right). In 1922 she was made a saint ("canonised"). Thanks to Joan of Arc's inspiration, the French went on to win the Hundred Years' War and drive out the English - who were left holding on to a small piece of territory around Calais. Napoléon Bonaparte (1769-1821) was a famous French general who became Emperor of France in the aftermath of the French Revolution. He was responsible for introducing measures which form the basis of many of France's institutions that still exist today, including an educational law to set up state grammar schools (lycés) which aimed to provide well-trained army officers and civil servants. During his reign France was constantly at war. Napoleon built a huge empire, so that by 1812 he controlled the greater part of Western Europe. Eventually he was defeated when France was invaded by Russian, Prussian, Austrian and British armies. Napoleon was exiled to the island of Elba. He managed to escape and ruled France again for just a hundred days before being defeated by Wellington at Waterloo. He was sent as a prisoner to St. Helena, where he died in 1821. Napoleon, Emperor of France after the French Revolution. Louis Blériot (1872-1936) was a French airman who bacame the first person to fly the English Channel. On 25 July 1909 he flew from Calais to Dover in 37 minutes. Joseph (1740-1810) and Jacques (1745-99) Montgolfier invented the hot air balloon. Louis Braille (1809-1852) invented the system of raised dots which form letters for the visually impaired to read. Louis was blinded in an accident at the age of 4. He was sent to one of the first schools for blind boys in Paris, where they were taught simple skills to help them earn a living without begging. Without being able to read, it was difficult for blind people to have much education. 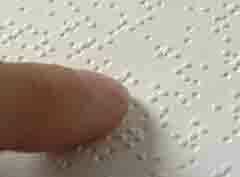 Braille's idea for using raised dots came from a ex-soldier, who had fought in the Napoleonic Wars. This man visited the school in 1821 to show his idea for raised-dot writing in wartime. Soldiers on the front line could pass raised-dot messages to each other silently, without giving away their position to the enemy. His system used 12 dots, and proved too complicated for soldiers to use in practise, but Braille started experimenting and worked out that people could easily "read" a 6-dot letter or number with their fingers. In 1827 the first book in "Braille" writing was published. Blind people welcomed the independence it gave them.- to write as well as read; but at first some schools for the blind tried to ban Braille. It is now used in almost every country in the world. See this play on the Braille200 website of the CNIB (Canadian National Institute for the Blind) celebrating Louis Braille's story of independence. Watch 'Young Heroes' (short film). People who ca't see very well can be trained to read letters made with a pattern of raised dots punched into paper. 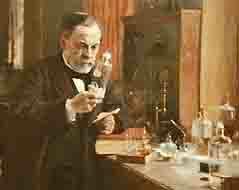 Louis Pasteur (1822-95) was the first person to understand the connection between microbes and disease. He developed the process of pasteurization, a method of killing the microbes in milk products by heating the liquid to a temperature high enough to kill the germs that are present, but not so high that it spoils the taste. Pasteur's experiments showed that microbes can be passed to people and animals in the air they breathe, the food they eat and the water they drink. He believed that microbes are the cause of many serious diseases and began work to find out if it might be possible to crontrol diseases by controlling the microorganisms that caused them. In 1885, Pasteur discovered the first successful vaccine for human use. He found that infecting animals or people with weak cultures of specific disease-causing microbes caused a resistance to the disease to build up, and this resistance provided protection against infection. Through his trials Pasteur developed successful vaccines to prevent anthrax (a deadly cattle disease that was ruining agriculture in France at the time) and rabies. The rabies vaccine has since saved thousands of lives and led the way for the development of vaccines against many other diseases. Louis Pasteur in his laboratory in 1885, the year he saved a boy's life by injecting him with an experimental rabies vaccine. He took a great risk, because he was not a doctor and so it was illegal for him to treat the boy. Marie (1867-1934) and Pierre (1859-1906) Curie were scientists who did pioneering work on radioactivity. Marie Curie was born in Poland and went to Paris in 1891 to study science. She met her husband Pierre while she was working as a laboratory assistant at the famous Sorbonne University. They worked together to isolate two unknown radioactive elements, polonium and radium. They received the Nobel physics prize in 1903. The radium the Curies had prepared up to this point was in the form of a compound and so they set about producing pure radium. Pierre was tragically killed in a street accident in 1906 whic left Marie to continue the work on her own. She became professor of physics at the Sorbonne; the first French woman to achieve such high academic honours. In 1910 she succeeded in preparing a minute amount of pure radium which won her a second Nobel prize. The Curie's work played an imortant part in the research leading to the treatment of cancer. Ferdinand de Lesseps (1805-94) built the Suez Canal - regarded at the time as the world's greatest engineering triumph, and tried but failed to build a Panama Canal. His long career as a French diplomat was ended by a change of government in 1849. 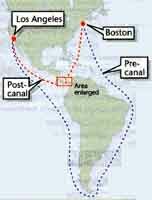 He used his overseas contacts in Egypt to promote his scheme for a sea-level canal (no locks) between the Mediterranean and the Red Sea, big enough to take ocean-going ships. The Suez Canal was opened in 1869, and bought by the British government in 1875 because it was a vital short-cut to India (then part of the British Empire). In 1879, aged 74, he took up his next big project - a Panama Canal, to link the atlantic and Pacific Ocean through the narrow 50-mile (80km) isthmus between North and South America..
Gustave Eiffel (1832-1923) designed the famous Eiffel Tower for the World Fair in 1889 which marked the 100th anniversary of the French Revolution. At the time, the Eiffel Tower was the tallest structure in the world. It was built with 15,000 pieces of metal joined together by 2,500,000 rivets and stood 320 m high. At night time it was lit up by 10,000 gas lamps. Gustave Eiffel received the Legion of Honour medal in recognition of his achievement. In the first year, 1889, two million visitors each paid five francs a head to climb to the top. Originally the intention had been to design and build a temporary structure for the Fair, but the Eiffel Tower proved so popular that it remains standing today. It earned Eiffel the nickname, "the magician of iron". He also built what for many years was the tallest railway bridge in the world, in southern France; and he designed the framework for the Statue of Liberty, France's gift to New York. Find out if pupils know of any contemporary famous people from European countries, especially France. Are there any sporting personalities or pop stars they know? The chances are that pupils knowledge will depend very much on current television exposure e.g. if a French racing driver is in the news or a French tennis player is doing well at Wimbledon.